Many investors ask, “Is it better to have a big bank (Goldman Sachs, for example) as my investment advisor or a Registered Investment Advisor (Bel Air, for example) to manage my money?” Following is a summary of the costs and benefits of each. The best investment platform should be determined by each investor’s unique preferences and principles. In short, reasonable minds can differ. Too big to fail. Very rarely will a bank go out of business, but RIAs will with greater frequency have ownership transitions through acquisition, merger, or closure. A flexible platform. 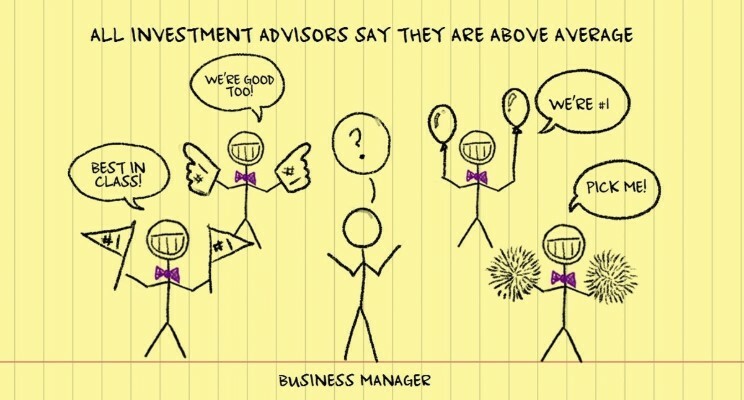 Each advisor has broad latitude to meet their client’s needs in a way that they believe is suitable. Few banks dictate an institutionalized solution that must be accepted. Depending on the bank, the platform varies from flexible to very flexible in how the advisor may decide to implement the client’s portfolio. “Deal flow” Banks have a distinct “investment banking” department that provides bank investment clients early access to interesting private equity deals and new issue public offerings. Greater autonomy and flexibility in fee negotiation. Each advisor is a business unit that can, within company guidelines, establish the client-level fee for the particular services or products being provided to that client. RIAs are much less flexible in their fee negotiations. Integrated banking functions with investment management solutions. Cash flow management, short-term credit facilities, long-term credit facilities (mortgages), personal banking, insurance, et cetera can be provided under one roof. Fiduciary Standard applies to all accounts. An RIA is not allowed to receive income from any other source than the client. It is difficult, even impossible, for a bank to say that there are no potential conflicts of interest in their management implementation. Institutionalized investment process. Investment decisions are typically made by an investment committee that has a definable and defensible investment strategy and process that is institutionalized and does not vary from client to client. Few banks have this rigid, institutionalized investment process. Most banks have a collaborative “so what do you think about this strategy” approach which makes accountability and measurement of future results difficult to directly attribute to the advisor. This blurring of lines of responsibility is less likely to happen with an RIA. If you like what they do, you buy their strategy and get their solution. Fees tend to be easy to calculate. Fees charged on “assets under management” utilize an agreed upon fee schedule. Most banks have a variety of fee arrangements which differ between clients based on the various strategies that the investment advisor recommends.